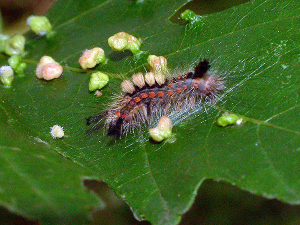 Observation - Vapourer Moth caterpillar - UK and Ireland. Description: Very distinctive moth caterpillar, no more than 2 cm long. It looks as if there are silk threads under the caterpillar, so it is probably starting to build a cocoon. Plenty of galls on the leaf too, if anyone fancies identifying those. Very distinctive moth caterpillar, no more than 2 cm long. It looks as if there are silk threads under the caterpillar, so it is probably starting to build a cocoon. Plenty of galls on the leaf too, if anyone fancies identifying those.